Do not use on a stool, an unstable chair or folding chair. With its compact fold, the booster is perfect for travel. Ultra compact folding design for storage and portability with removable machine-washable seat pad. PORTABLE BOOSTER SEAT. YOU WILL RECEIVE 1 BOOSTER. POP N' SIT. 4Moms Magnetic Tray Top Adjustable 3 Height Position Kids High Chair Black/Grey. The bowls and plates stay in place on the magnetic tray top to help prevent unwanted spills and assist with self-feeding. When your baby needs a place to eat, just pop it open. Bon appetit! Item model number: 13543. Durable construction for indoor or outdoor use. Detachable, dishwasher safe tray (BPA free). Batteries required: No. Durable Product. Durable construction for indoor or outdoor use. Detachable, dishwasher safe tray (BPA free). This is a Fisher Price feeding booster. It is used. Supposed to have main tray and 2 others. Missing top tray.. my son loved this. 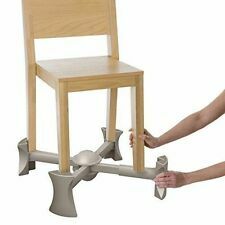 It's a great booster and mounted to any chair. I mean any!! This is used. While I tried my best to clean it well, please note there may be some child food residue somewhere on it. Tray comes off and back folds down nicely. Adjustable height 3 position. Great booster in my opinion. Ask questions and see pics as there are no returns. The under seat storage is perfect for storing cutlery, wipes, and all your feeding essentials. 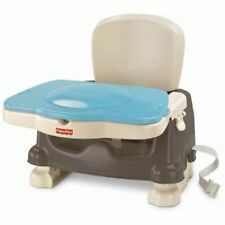 As your child grows, the tray can be removed enabling toddler to use the booster seat to sit at an adult table. OPEN BOX, NEVER USED. Arizona orders only and will be calculated at checkout. 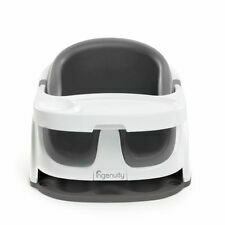 P A Y M E N T.
This INGENUITY SMART CLEAN TODDLER BOOSTER SEAT is slate gray. It’s Condition is brand New in unopened packaging. It’s lightweight and compact for portability. Chair straps are included. Shipped with USPS Parcel Select Ground or priority, you choose which is best for you. 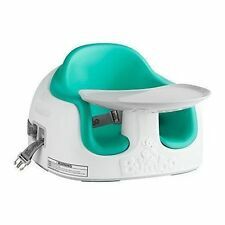 Baby Smart "COOSHIE" Booster Seat (Cooshee) Black Excellent Condition! Only marking is marker on bottom on chair. See pictures. S pring Floral Pattern of Pink, Green, Orangeand Cream Y ellowtones. Works great - Brown. Condition is Used. 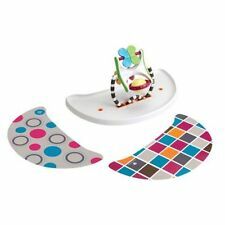 Little Tikes My First Seat Baby Infant Foam Floor Seat Sitting Support Chair, (Missing Box, Item is new in bag.). Supportive- high and firm back side provides extra neck/back support enabling child to sit up right. Extra support for baby and you. Baby Snug is the safe, supportive seat that adapts to fit their changing size. Great for keeping your little one entertained while they learn to sit up unaided, particularly when you're out and about! When your baby needs a place to eat, just pop it open. Bon appetit! These were manufactured to be used in the USA. Use outside of the USA at your own risk. QUICK LINKS. New Arrivals. Durable construction for indoor or outdoor use.